On this page, we will feature one image from each Issue. Hit your back button to return to this page. 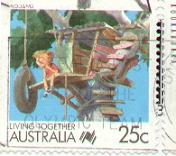 This image is on a stamp from Australia, contributed by Gary Wong. 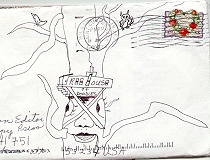 This image was drawn on the envelope sent by Dr. Surearts. Tree House - Issue 3 Partially complete online, completion expected sometime in 2005. Unsolicited materials are greatly appreciated. Send a clear photo, detailed drawings, or any other forms of visual documentation of your real or imagined tree house. Original articles are also accepted on the subject matter, but photos or detailed drawings must be included with any submissions. Any number of pages may be submitted, however, maximum size is 8.5 x 11" for each page. No cash payment is offered for submitted materials, but all contributors who are published will receive a free copy of the latest issue of Tree House. Publication is not guaranteed and is at the sole discretion of the Editor. Submission implies that one time publication rights are extended to the Editor. is published on an irregular basis. As of July 2003, this will be an online zine only.